Say no to the No Billag initiative! 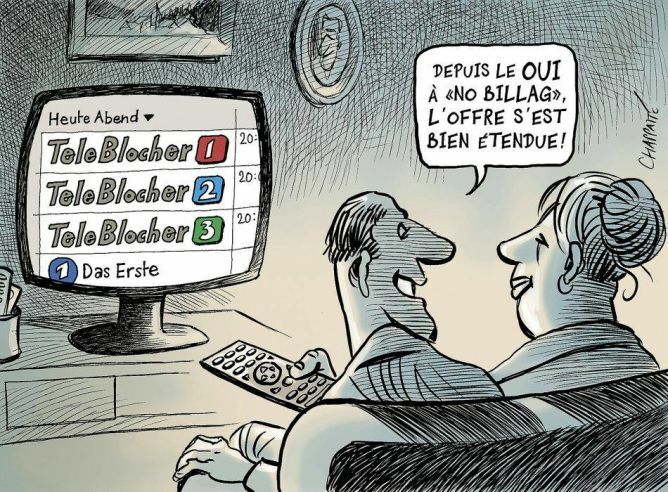 On March 4th 2018, we will vote on the No Billag initiative. If it passes, we will not only do away with the radio-tv fee, but we will effectively be forbidding the federal government from organizing any form of public financing of radio and TV altogether. The SSR-SRG and most local radio and TV channels will lose the better part of their budget. They will not survive this. Thanks to the radio-tv fee, the independence and fairness of Swiss radio and tv journalists is guaranteed as their financing is mostly public, and comes with a clear obligation to «present events accurately and allow a diversity of opinions to be expressed appropriately»(Federal Constitution, art. 93). Moreover the french, Italian and Rhéto-rumantsch speaking parts of Switzerland get more money from the radio-tv fee than the Swiss-germans, which allows them to enjoy high quality radio and tv that covers their local news despite a low population. Thanks to the radio-tv fee, one third of all of Swiss cinema’s financing comes from the SSR-SRG through the «Pacte de l’Audiovisuel». The SSR-SRG and its subsidiaries support many film and music festivals, and they broadcast and promote Swiss artists and culture on their channels. In doing so, they generate revenue for Swiss artists by paying royalties. Thanks to the radio-tv fee, everyday we can follow our favorite Swiss athletes in the Swiss and international competitions. Our public service radio and TV have an interest in small regional clubs and they broadcast local competitions. Who will show us the Swiss athletes at the Sion 2026 olympic games if Switzerland doesn’t have its own channels anymore? 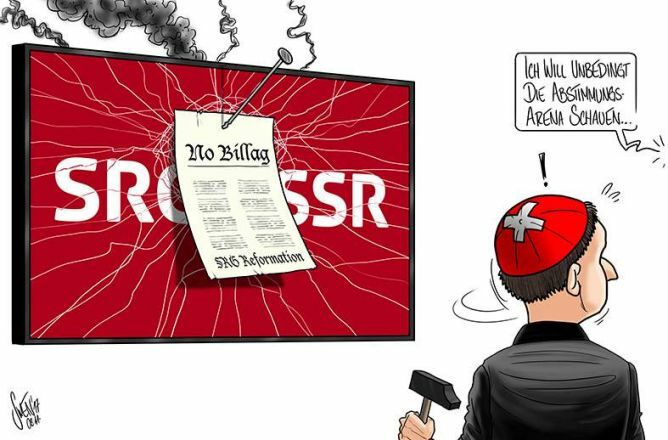 A lot of people think that the the No Billag initiative asks «do you want to keep on paying Billag bills?» or that the initiative would make the radio-tv fee optional. 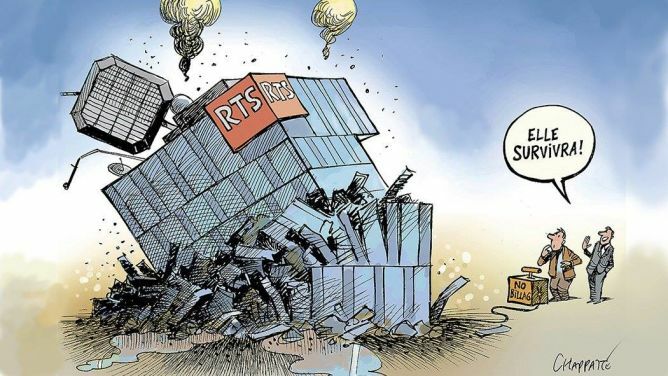 Few people know that it is about deciding whether or not the SSR and the other radio and tv channels will survive after January 1st 2019. More than just consumers, we are citizens who believe that it is important to have a strong public service in media just like every other democratic country around us. The health of our democracy is at stake, our national unity is at stake. This battle is far from won. Several polls indicate that if we voted today, the initiative would be accepted. It’s no surprise when you consider that 60% of the Swiss do not think that the SSR would disappear in the YES wins. Most people do not want to destroy our public service media. They simply haven’t realized yet what the consequences of this deceitful initiative really are. It’s our job to inform them! What will we do with 120'000.- CHF? As we all know, a national political campaign is expensive, very expensive. There are only a couple weeks left to get our message out by all means necessary, be it through billboards, advertising in print press, online or on social media, in four languages! Media For All is an association that defends the diversity and quality of press and media in Switzerland. We are filmmakers, journalists, and union workers. We believe that a vigorous, independent and dynamic press is absolutely essential to the health of our democracy. With only a couple weeks left before the vote, it is crucial to reach the widest audience possible and to convince all the undecided to lean towards saying NO to No Billag. Thank you so much for your support! I don’t have any money, but I’d love to contribute, what can I do? Get the word out! Talk to your friends, your co-workers, your family about our campaign, post something on facebook and help us reach our goal! This project ended successfully on 28/1/2018 14:00! Go see a Swiss film! Get a DVD and a magazine! Vous recevrez un billet pour Athletissima à Lausanne le 5 juillet 2018, dans le secteur près du départ du 200m! Et votre nom sera inscrit sur la page de remerciements du site savethemedia.ch. Vous recevrez un billet pour le spectacle Le Fric de Vincent Veillon et Vincent Kucholl (8 juin à Genève ou 11 octobre à Lausanne), offerts par Opus One! Et votre nom sera inscrit sur la page de remerciements du site savethemedia.ch. Vous recevrez un billet pour un concert au Cully Jazz Festival (13-12 avril 2018)! Et votre nom sera inscrit sur la page de remerciements du site savethemedia.ch. Visit a Swiss film set! Play in a swiss series! 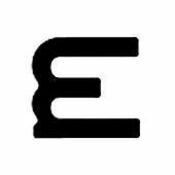 media for all is an association that defends the quality and diversity of media in Switzerland. It was created in 2015, in the aftermath of the vote on the LRTV. media for all is involved and engaged in all political battles that concern the press, be it written, radio, TV, or online.